The British government’s preferred route for the proposed high speed rail Y network announced on 28 January 2013 included a connection with the West Coast Main Line (WCML) just south of Crewe. According to Command Paper 8508, the journey time from London to Liverpool would be 1 hour 36 minutes. However, the January 2013 service concept showed only one of two Liverpool trains each hour being routed over the Crewe connection. The other one, serving Stafford, would leave the new track near Lichfield (and could not reach Liverpool in 96 minutes). There would be three HS2 services per hour from London to Birmingham Curzon Street, two of which would stop at Bickenhill (“Birmingham Interchange”). Although demand would be unlikely to warrant 1,100-seat very high speed trains stopping at Bickenhill, one of the two “stopping” Birmingham trains would be split there, with one portion forming the London-to-Liverpool-via-Stafford service. HS2 Ltd’s clumsy service pattern would entail every third Birmingham train (even in the peak) being limited to 200 metres (i.e., lower capacity than current 11-car Pendolinos). The January 2013 concept would have a lower maximum capacity to Birmingham and Liverpool than the equivalent in Rail Package 6. HS2 Ltd’s plans for a high speed line would only provide two embarkation points in the West Midlands, with one of those being a parkway. By contrast, the RP6 concept would enable travel to London by fast train from all seven West Midlands boroughs. 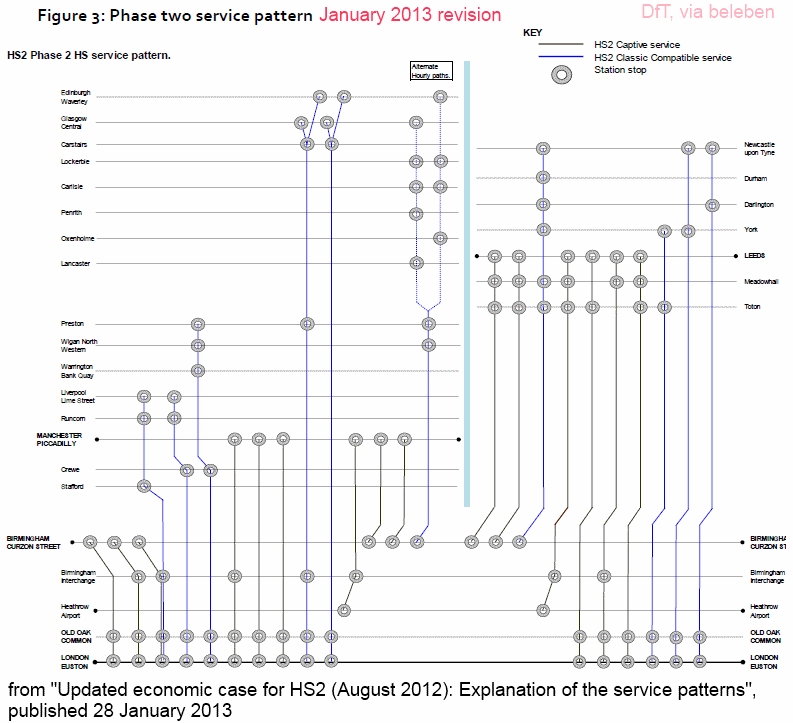 In the illustrative RP6 standard hour service pattern above, 3 West Midlands intercity trains would be routed via the Chiltern Main Line, with Black Country boroughs being directly served. 1. To reach Walsall and Wolverhampton, trains would be routed over the Soho loop, via a connection at Benson Road. 2. The Midland Metro tramway between Birmingham and West Bromwich would be reconverted to heavy rail, allowing regional and intercity trains to access the heart of the area. 3. ‘Birmingham Airport’ station is currently named ‘Birmingham International’. 4. Chiltern intercity trains would not serve Moor Street. 5. If trains terminated at Old Oak Common instead of Paddington, there would be no effect on Great Western Main Line pathing. 6. Interregio London Midland trains routed via Northampton would be unaffected. Switching West Midlands intercity trains to Chiltern would enable a step change in efficiency on the West Coast route from Euston to North West England, with London Midland commuter capacity benefiting immediately. In the extended Rail Package 6 concept, the Great Central route between Ashendon, Banbury, and Leicester would be reactivated, with the tracks connected to the London and North Western (West Coast) route in the Rugby area. The link lines would probably need to run well to the north or south of the town centre, to avoid adverse effects on the built-up area. However, there are potential advantages in having a restored line cross Rugby on an alignment similar to the original. By situating GC platforms on a new bridge over the West Coast tracks, Rugby would become a two-level interchange station, providing new regional travel opportunities. The British government’s main justification for its HS2 rail scheme has been demolished in secret figures released to the High Court, reported Andrew Gilligan (Sunday Telegraph, 9 December 2012). Ministers say the controversial £34 billion train line from London to Birmingham and Manchester is “desperately needed” to tackle a “capacity crisis” and “time bomb” on the existing route to these cities, the West Coast Main Line (WCML). They claim that passenger numbers on the WCML are growing so fast that it will soon be “full” unless action is taken. In fact, however, the Government’s own official passenger counts show that almost half the seats on the line’s peak-time trains last year were empty. They also show that peak-hour crowding on the line has actually fallen in the last three years. But they were forced to give way after opponents last week launched a High Court judicial review against the plans. The figures were delivered on the last working day before the case started. Announcing the go-ahead for HS2 this year, the then Transport Secretary, Justine Greening, said that capacity lay “at the heart” of her decision. “Unless we take action, by the 2020s the West Coast main line will be full,” she said. Theresa Villiers, the then transport minister, said Britain faced a “capacity time bomb on the West Coast Main Line” and HS2 was the only way of tackling the “capacity crisis” on long-distance routes. Following the government’s reluctant revelation that Euston long distance peak departures are only about half full, the high speed rail lobbying company Greengauge 21 issued the following press release. Claims that trains leaving Euston in the evening peak are only half full are wrong. While this is true for Virgin Trains (52% seats occupied), Network Rail has pointed out that London Midland – which runs the commuter services — is at 94% capacity, and traffic levels are growing at 4% a year. Even with 52% average loading, some Virgin trains are 80% full – and on Fridays they leave with standing passengers for long distance journeys. “The important point that anti-HS2 campaigners fail to acknowledge is that the best way to free up capacity for commuters in the fast growing Milton Keynes – Northampton corridor is to take the Virgin Trains services off the line and free it up for more commuter services and for more freight services. Our studies have shown that a transformed timetable can be offered, supporting growth, relieving serious overcrowding which is coming just a few years down the line and getting a lot of lorries off the road network”, Jim Steer said. Virgin Trains operates the West Coast long distance high speed services between London, the West Midlands, North West England / Scotland, and North Wales. But the only ‘West Coast’ destinations served by the new-build HS2 high speed line would be London, Birmingham, and Manchester. So it is not possible to “take the Virgin Trains services off the line”, without damaging connectivity for all the other towns along the line. Developing a more efficient West Coast timetable does not require the construction of HS2. Jonathan Tyler, who prepared a WCML concept timetable on behalf on Greengauge 21, does not share Mr Steer’s enthusiasm for new-build high speed track. By Southern or Eastern Region standards, the Euston commuter services are neither particularly heavily used, nor particularly crowded. But if the Rail Package 6 concept were implemented — with West Midlands intercity services transferred to the Chiltern Main Line — the need to stand on Euston London Midland commuter services would be eliminated. Spending £17 to £40 billion on a new railway is not a proportionate or rational response to Friday evening crowding on Virgin Trains. There are much more cost-effective ways of managing capacity on the rail network.